OWNERSHIP: Genesee Valley Transportation, Batavia, NY (physical property owned by Lackawanna County, Monroe County, NS, Steamtown and the D-L). Carbondale Main Track - former D&H - 17.6 miles on the Delaware & Hudson main from CARBON (former D&H Minooka Jct. ), to the end of track in the old Carbondale yard, including the Vine Street Branch, which provides a connection to the former Lackawanna trackage via the Diamond Branch. The Vine Street Br. of the D-L leaves the Pocono Main Mall Siding in front of Bridge 60 tower at the "Diamond Switch" on the alignment of the former DL&W Diamond Branch (through the State parking lot & across Lackawanna Ave.), and at station sign "STRAW" it connects to the rebuilt former D&H Strawberry Hill line. This allows the D-L to connect their Pocono & Carbondale Mains without operating over CP through Taylor Yard's bottleneck. The Branch also continues on the Diamond Branch alignment to a point where the D&H's Vine Street Branch from Green Ridge Yard connected with the DL&W Diamond Branch, here the Diamond Br. splits off & is used for a short ways as a storage track, and the Vine Street continues to the rear of the former D&H freight house where there was a small yard where D&H and the DL&W did most of their interchanging. Today the yard is reduced to 2 tracks and is a storage yard for 7-D Lumber one of the DL's larger customers. The Vine Street Branch continues through backyards & on to Green Ridge Yard, but with the Strawberry Hill connection in service, the remaining part of the Branch is not used. The DL (home of GVT's System Shop - Alco Heaven) is located at the end of Breck Street, off of Pittston Ave (Rt. 11), in the South Side section of Scranton, right behind Notarrani Produce. That is where a one track siding, together with the enginehouse leads are used for making up trains, and the starting point of all crews. Crew line ups are directed out of the DL's offices on the second floor of the former D&H freight house, which the DL shares with its landlord - the Lackawanna County Railroad Authority, and customer 7D Lumber on the lower level. The DL normally has two or three crews going on duty five days a week at the GVT South Scranton shop in the early morning. There is no set schedule as to what crews go where or when. It is all on an "as-needed" basis. Carbondale sees 4-5 day/week service. Note that the third crew works Sunday at 0800 and are on-call Monday-Thursday. The trip down to the R&N at Pittston has become an infrequent route, as all of the DLs NS interchange is now made directly with the NS at Portland with the DLs Portland Turn, which usually runs on Tuesday and Friday. In addition to the Portland turn, a propane dealer in Tobyhanna warrants more than two trips a week up the old Lackawanna main, as well as the CP-powered grain trains to Mount Pocono. The Portland Turn will service the propane dealer as well as the grain train, and an occasional gas extra as the weather gets colder. UPDATE - 11/26/01: In Scranton the DL has begun serving a new location for Laminations, located in a deep rock cut the new track is accessed by a switch back next to the co-gen plant at Archbald, Pa, on the Carbondale Line of the DL. The trackage provides interesting photo possibilities. The Kane freezer warehouse in South Scranton has been sold to Henningsen, a large national freezer warehouse company that is very pro rail. Look for more refers and Cryo cars to begin showing up in Southside. In the spring of 2001 the DL began the operation and dispatching of Lackawanna Countys scenic trolley operation from the Steamtown platform to the Iron Furnace Site, and on to Roaring Brook, following the rehabbed Laurel Line trackage. In conjunction with this operation, the County has purchased and rehabbed the former Laurel Line Crown Avenue Tunnel and trackage out four miles to the Lackawanna County Visitors Center at Montague Mountain. Expansion of the trolley operation is expected to be phased in over the next two years. In the interim the DL is providing freight service to Compression Polymers via an interchange with the L&S at Little Virginia. TRAINSPOTTING LOCATIONS: Steamtown National Historic Site - inclusive of the DLs Bridge 60; the west portal of Nay Aug tunnel from the banks above the tunnel from the park of the same name; switching at the Mt. Pocono flour mill; grinding the grades of the eastbound and westbound assault on the Pocono grades; the scenic Delaware Water Gap; along the Carbondale Main; switching the customers on the former D&H Vine Street Branch; and from a public road at the south end of D&Hs Taylor Yard. Aim camera all the way to the left and up 7/8 of the way, and zoom in to view Bridge 60. INTERCHANGE POINT & RAILROAD: The D-L is now interchanging with NS at the new Slateford Junction Yard (MP 74.27). Service by NS is now Sunday, Tuesday and Thursday. D-L's PT98 and PT97 turns operate Monday, Wednesday and Friday. Other interchanges include Taylor Yard with CP; Pittston with the R&N via CPs Taylor Yard; and a new interchange with the Luzerne & Susquehanna (L&S) at Little Virginia. LOCOMOTIVE ROSTER: GVT maintains the largest fleet of Alco 251 & 244 powered locomotives, and the South Scranton Shops functioning under the artful hands of ALCO DOC, a.k.a. : Don Colangelo, GVTs CMO, continues to restore and upgrade GVTs fleet of over 25 Alcos. GVT power rotates regularly in and out of Scranton, so please click here for a complete and up-to-date GVT roster. 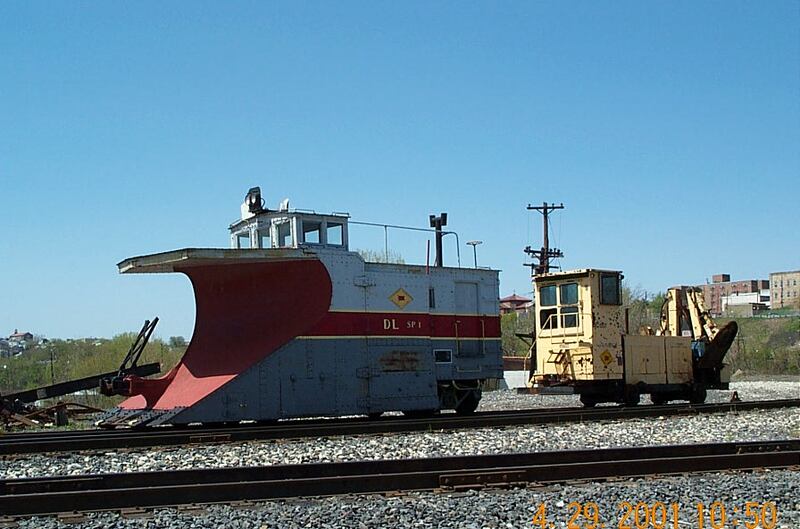 The DL has a fleet of over 100 50 boxcars and 50 gons, a former CP wedge snowplow, and a former PC transfer caboose. 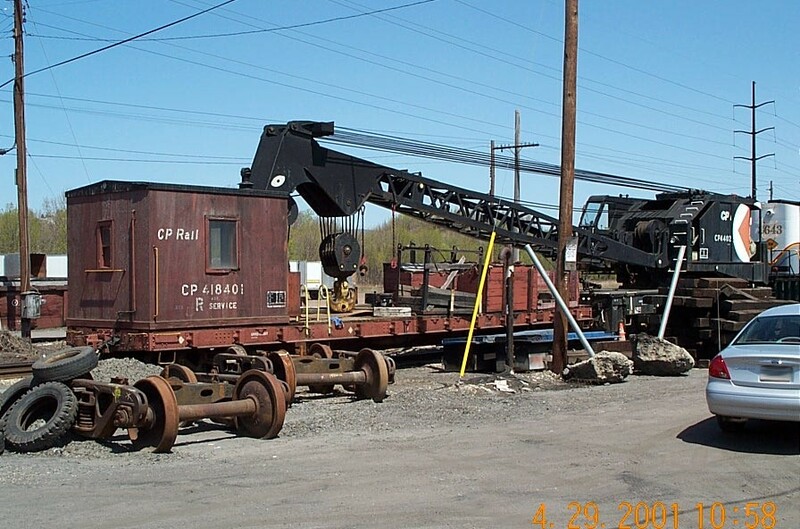 The DL recently took delivery of a 135-ton former CP diesel American crane and idler car. The unit will be used in locomotive wheel and prime mover change outs at GVTs South Scranton shop, and for major track realignment projects. 2000 - The DL just completed their most successful year in its companys history, having record months in merchandise traffic in 8 out of the 12 months of 2000. The CP unit run through grain trains going to the Harvest States Mill at Mt. Pocono, exceed the mills second year expectations with well over 3000 cars received. The mill is located on the old Lackawanna main at MP 101, on the former Chrysler auto unloading site served by the EL & Conrail. Trains to the mill arrive in unit train service, with run through Canadian Pacific SD40, SD60 and "Red Barns" delivering loaded grain cars to the mill. The D-L has been hauling freight on this line since 1993 to the Tobyhanna Army Depot, and to Keystone Propane who opened a large transload plant across from the Tobyhanna station in the summer of 1997. The DL received the first grain train for Harvest States Milling (HSM) at their new mill at Pocono Summit at 4:30 PM on Tuesday September 15, 1998, in a run-through hand off from CP to the DL at Taylor Yard Scranton, Pa. The DL added their 2461 to a trail position on the train after the runaround move was made at Taylor, and after waiting for traffic to clear at Taylor, the two CP SD40's 5647 and 5601 led the C425 and 25 cars of grain weighing in at 2475 tons, up the west slope of the Poconos out of the Lackawanna Valley, for a 32 mile run to the mill. The train made a nice 1:18 run to the mill arriving just before 7:00 PM. Mill manager Regis Weiss stated the "this is an exciting day for us, until now, we were just overseeing construction of the flour mill. Now this is the starting point of our operation here". The grain received will be the start of operation's plans to fill all of the sixteen 130 foot tall silos, allowing them to "settle" for at least 45 days while the finishing touches are put on the milling and bagging equipment. Actual milling began in December 1998. Prior to the 2 to 3 unit grain trains per week, and the build up of the Keystone Propane business, the track was used by Conrail, in December 1996, when they detoured a couple of GPU Energy unit coal trains to their plant at Portland. These detours occurred while the regular route over Conrail's Portland Secondary was washed out. 2000 saw a month after month growth by Keystone Propane at Tobyhanna, a revitalization of the inbound and outbound business at Chamberlain Manufacturing, adjacent to Steamtown in downtown Scranton, Pa., and the location of a new lumber wood processing facility on the old Lackawanna main at Cresco, Pa. The latters siding is expected to be installed by mid May. Working together with the Lackawanna County Railroad Authority, the DL completed a complete resurfacing of Bridge 60 in Scranton, along with a reconnection and complete rebuilding of the historic DL&W Diamond [mine] Branch. The Branch diverts off of the Pocono Main on Bridge 60, and provides a strategic connection to the DLs former D&H main, via the Vine Street Branch. Previous access between the EL and D&H lines were only over access rights over the CP/D&H. With the rebuilding of Bridge 60, the North leg of the WYE was reconnected [on a alignment slightly west of the former DL&W/EL through main]. This newly replaced track allows two connections to the CP main, and straight northbound/southbound [EL east-westbound] moves from off of the CP on to the DLs Pocono Main, and points east. Occasionally, unit grain trains are interchanged to the DL over this leg of the wye, and onto the Mall Siding, rather than the runaround move at Taylor Yard. For the fifth year in a row, traffic on railroad tracks in Lackawanna County has increased, with more cars hauling more material to and from than any year since the system was activated. A total of 6,418 carloads of freight moved across the county during 2002, up 7 percent from 2001, according to Larry Malski, executive director of the Lackawanna County Railroad Authority. The authority owns the tracks and contracts with Delaware-Lackawanna Railroad Co. for usage. When the authority launched services on the lines in 1985, just 393 carloads rolled over the tracks. In the past five years, use has jumped 270 percent. Those statistics are in keeping with national rail trends, according to Warren Flatau, spokesman for the Federal Railroad Administration. "Generally speaking, smaller railroads and carriers have continued to increase over the last several years," he said. "Despite what's been happening with the economy, hauling and material transport traffic on our rail lines continues to climb." Chuck Riedmiller, Delaware-Lackawanna vice president, attributes the increase to the railroad and rail authority's efforts to attract new business. In recent years, Chamberlain Manufacturing and Compression Polymers in Scranton and Brojack Lumber, which has a distribution site in Archbald, have put more of their products on the tracks. Recently, Valley Distribution in South Scranton added 400 cars a year to the railway, using the lines to transport paper from Canada, Mr. Riedmiller said. "Basically, the increase is attributed to the great working relationship we have with the authority," he said. "Everyone involved works hard to make this work, and it does." 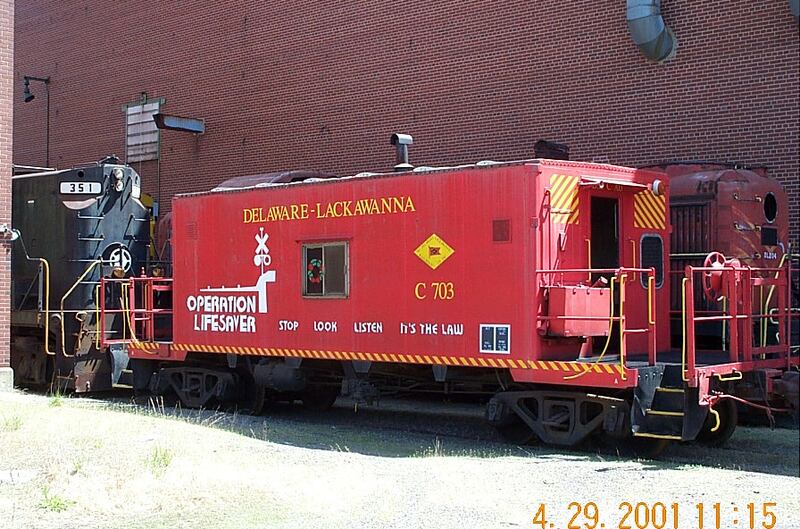 Delaware-Lackawanna gives the authority about 10 percent of the money it earns on the railway. The county program has helped make railroading in Northeastern Pennsylvania a growth industry, Mr. Malski said. He views that success as a tribute to the railroads that originally built the area. "These (cars) actually equate to new jobs," Mr. Malski said, as area businesses are better able to distribute their products and grow their companies. "The railroad itself is an example. In 1985, it employed five ... now it employs more than 25." GVT RAILS "the" Delaware-Lackawanna RR Co. Inc. (DL) announces, that thanks the Monroe County Railroad Authority (MCRA), they can now formally add the Delaware to their name, as a long term lease/purchase agreement has been consummated with Norfolk Southern Railway Corp. Under the agreements the D-L will assume the operation of 10 miles of former Lackawanna Railroad mainline trackage from Analomink/Gravel Place (NS MP 12.2), through the famous Delaware Water Gap and on into Portland, Pa. (NS MP 2.0) where they will interchange with NS. The new line brings the D-Ls total trackage in the Lackawanna Valley-Pocono Mountain Region to 88.7 miles. The new trackage will be operated as an extension of the D-Ls Pocono Main. Bob Hay, Chairman MCRA, Larry Malski, MCRA railroad consultant, and David Monte Verde of the DL all cite the transaction as an excellent example of team work, partnership, and cooperation between a Class I railroad-NS, private regional Railroad-the DL and a county railroad authority-MCRA to foster a win/win railroad revival which will benefit the entire railroad industry. This trackage is an intricate piece of the railroad map which will provide Monroe County the rail access needed for the resumption of through passenger service from Scranton, through the Poconos, Monroe County and New Jersey into New York City. The famous Lackawanna Cut-off, now under study for the resumption of passenger rail service, diverges from this new line at Slateford Junction in the Water Gap. The Stroudsburg Secondary operation by NS was formally ended in Norfolk Southerns Bulletin Order #185: "Effective 12:01 AM, Friday September 14, 2001, Delaware-Lackawanna Railroad headquartered in Scranton, Pa. will take ownership of and dispatch all movements between MP DG 2.0 and Gravel MP DG 12.2." The famous fence west of GRAVEL, once a statement by Conrail that the Pocono Main Line ends here, has been removed in preparation to become the new owners mainline. The DLs Bridge 60 dispatchers will commence control of trains over this the new segment of track. The new trackage gives the DL access to four new rail customers, which include DiverseyLever Chemical and National at Gravel Place/E. Stroudsburg, PA. Hughes Printing at, and Rock-Tenn Packaging - East Stroudsburg, PA. Along with the new customers added by the DL, they will also be interchanging with the NS at Portland, thereby giving the DL a more direct connection to NS and the ability to run over their own railroad rather than two foreign roads to receive their NS interchange. Interchange with NS is intended to be Monday, Wednesday and Friday, returning regular daylight rail service through the historic Delaware Water Gap. This operation will place the famous DL ALCOs through the Gap in daylight hours, at least three days per week. The first interchange train is scheduled to operate on September 17th. It is also likely that these interchange runs could include in its consist the DL 2461, which began life as EL 2461, which made many runs through the Gap as an EL unit. GVT RAIL is a New York based holding company with headquarters in Batavia, NY. It owns five freight railroads, which operates approximately 285 route miles in 2 states-New York and Pennsylvania. With the movement today of 4 dimensional loads GVT Rail's Delaware-Lackawanna RR, saw the culmination of close to $1m in capital improvements done to its Pocono Main between Scranton and Portland, Pa., to accommodate over 25 dimensional loads bound for the Pennsylvania Power & Light's coal generating plant at Martin's Creek. When the NS's former Lehigh & Hudson River RR bridge at Phillipsburg, Pa. could not accommodate the loads PPL officials sought an alternate route, and they turned to the D-L.
Like in 1996, when the DL came to the rescue of Conrail to get coal around a flooded line to the Portland power plant, the DL again came to the rescue of another Northampton County power plant. Looking to expand their Martins Creek Plant, PPL faced a costly trucking and bridge building process as an alternative, so the capital improvements to the DL became a better option. Work was performed on an expedited basis during April, May, and June, by forces from R. J. Corman and DL's track department. Work included the replacement of close to a mile of curve worn rails, jacking of an old Erie Railroad bridge, a 2400 feet extension of the Winton siding to a new station sign COBBS, realignment of the "Conrail end of the line curvature" at Analomink, and the replacement of ties on the Receiver Track east out of Scranton. The two mile rehab of this track provided access to the south track (former EL eastbound main track out of Scranton) of the Nay Aug tunnel necessary to clear the 19'6" dimensional loads that moved on this date. In addition, the NS' Old Main under the Lackawanna Cut Off"s Delaware River bridge was centered to give the entire line a 19'6" clearance route. Matching funds to a Penn DOT Rail Freight Assistance Grant the D-L, through the Monroe County Railroad Authority, is about to enter into a contract to construct a modest two track interchange yard running east from the old Slateford Tower in the Delaware Water Gap. The tracks will be constructed on, the railroad south, side of the "Old Main" leaving room between the tower and the new construction for the reconnection of the Lackawanna Cut Off to New Jersey. The yard, west of Portland, will provide a place for the NS and the D-L to interchange cars for their fast growing business, while eliminating the present end to end interchange at Portland. The construction will open a small vista of the Gap from the former Cut Off overhead, as the site is cleared in anticipation of the construction. Work is expected to be completed by September. In addition, the D-L will be matching funds to a Penn DOT Rail Freight Assistance Grant, obtained through the Lackawanna County Railroad Authority, to install over 4000 ties between Scranton and Moscow. Contractors will be starting the installation of these ties in late July, and a DL bolt tightening and replacement project, along with surface work will follow the tie work. This section the up Pocono Main up the west slope of the Poconos sees heavy traffic with the grain trains, the Portland Turn, and the Steamtown excursions which started running on July 4th. Thursday January 17th saw the D-L start service on the the Minooka Industrial Track formerly operated by the L&S. A week previous the Lackawanna County RR Authority had purchased the property and named the D-L as the operator. Connecting with thier refurbished Laurel Line main at Little Virginia, the 2.2 mile line is slated for immediate upgrade including new rail and ties. Originally built by the L&WV with light used rail it is now seeing heavy tonnage as plastic pellet cars are moving to Compression Poloymers over the line. On Thursday the D-L used leased SW1 and C420 334 as a helper to move 9 loaded pellet cars through the Laurel Line Tunnel. With the SW1 on the point and the 334 shoving the rear both units were in run 8 from Roaring Brook through the Tunnel and up under I-81, quite a sound was heard through the little valley! The D-L plans to rehabilitate the MIT and upgrade the line to 115 lb rail in March 2002. Trains on the MIT operate under symbol LL1 to service the D-L's 2nd largest customer, Compression Polymers on Tuesdays & Fridays. The train operates through the newly restored, mile long Crown Avenue tunnel to reach its destination. HISTORY: Former DL&W and DH trackage.